It is said that employees don’t leave companies; they leave people. Learn about how the immediate supervisor enhances employee engagement! employees are motivated and dedicated to making the organization a success. and repeat business. Engagement also leads to improvement in retention levels. In short, it impacts the bottom line. her direct reports is the most influential. The immediate supervisor performs a pivotal role. He or she connects an employee to senior management and vice versa, becoming the primary conduit for the flow of information within an organization. Top down, management imparts its goals and values through the supervisor who can best explain to individuals what these mean and how they may affect employees. Bottom up, the immediate supervisor ensures that employees’ voices are heard, listens to their concerns and responds to them, and passes that feedback to senior management. It is said that employees don’t leave companies; they leave people. What managers do, how they behave, what they say and importantly how they say it affects employees’ attitudes about their jobs and the organization as a whole. Employees who are unhappy and dissatisfied with their immediate supervisors are less likely to identify with the organization’s vision and more likely to be absent or to resign. Employees who are engaged take pride in their work, support organizational goals and are less willing to change jobs for a minor increase in salary. Employees were asked to rate satisfaction with their immediate supervisor. Forty-nine percent of those employees who were very satisfied with their direct manager were engaged, and an astonishing 80% of those who were very dissatisfied with their immediate supervisor were disengaged. 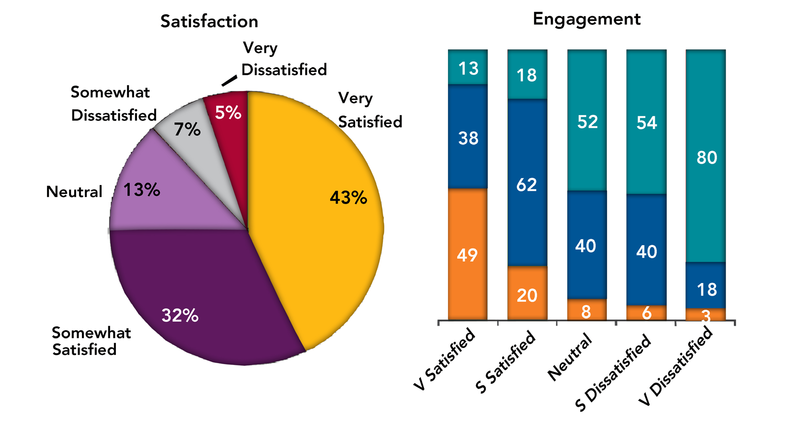 While the role of emotions in the workplace has been explored in detail in another Dale Carnegie Training white paper, “Emotional Drivers of Employee Engagement,” it is important to note that fully engaged employees express feelings of enthusiasm, empowerment, confidence and value based on their interactions with their direct managers. While a good supervisor makes all employees feel valued and confident, a poor supervisor irritates them and makes them feel uncomfortable. rates, fewer sick days and less absenteeism. her. Over half of these employees are engaged. Successful managers lead by example, which generates enthusiasm and inspires employees to work harder. A remarkable 62% of engaged employees say their manager sets a good example, compared to only 25% among those not fully engaged. Supervisors who delegate and trust employees to carry out tasks empower their staff to make decisions; 40% of those who feel empowered are engaged. the organization. 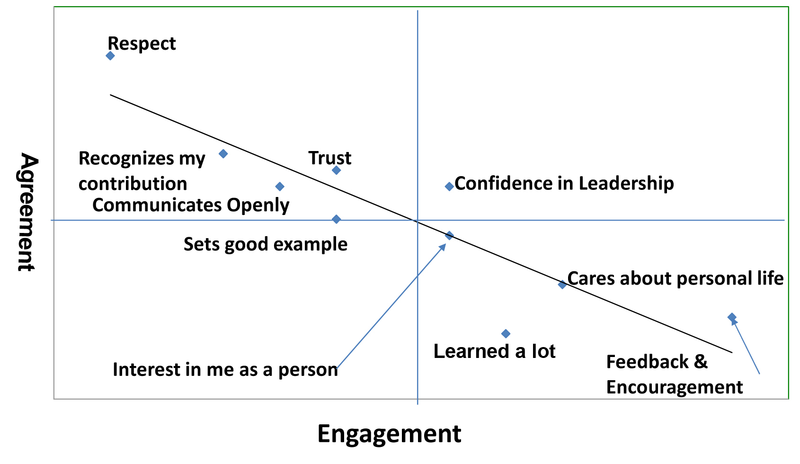 Supervisors who communicate and trust and respect their staff generate the highest levels of engagement. low-income and low-level employees are among the most disengaged. The role of the immediate supervisor is vital in ensuring these employees, who are often in clerical or sales positions with direct customer interaction, feel their job is valuable and understand the contribution they make. Employees perceive their value as an individual through the prism of the immediate supervisor. Recognition of their contribution, along with feedback and encouragement on their performance from their manager, leads to increased confidence, commitment and achievement. Failure to recognize and reward good work can negatively impact employee morale and productivity. Many respondents say that their supervisor respects them, but fewer mentioned that their supervisor provides feedback or encouragement tto improve. This last aspect is what most generates engagement. These caring activities are two of the four most important drivers of engagement. leads to more satisfied customers and increased sales. are engaged. Among the two-thirds who do not believe this, only 17% are engaged. leading to increased productivity, quality of service and higher profitability. This entry was posted in Agile and Strategic Planning, Agile Arguments, Agile for Beginners, Agile in the Enterprise and tagged Agile, Agile Adoption, Agile Thinking, Business Agility, Business Management, CEO, Dale Carnegie, Employee Satisfaction, HCM, Keeping Agile, Organization. Bookmark the permalink. This says it all. Toxic managers cause good people to leave. Even more than good managers engage people. Getting rid of bad managers should be priority. It sounds like a focus on the negative, but with those toxic managers in the organization you will not get much traction with any positive initiatives. Very good series of with papers from Dale Carnegie! Thank you Katie for letting Brian post these! This was a good series of posts Brian. I do hope that you and Kathy follow through on some of the ideas you talked about! Same here Brian. I think it would make a very interesting post! Thanks for sharing this series Brian!